One of the finest Fourth of July parades in the Midwest can be found in Tomah, smash dab in the middle of Monroe Country in southwest Wisconsin. The small city of 9,000 folks supports a 10 AM parade of over 120 units, moving right down the main street of Superior Avenue. You have your usual floats; Cranberry Queen, Butterfest, Knights of Columbus, VFW, American Legion, about 20 in all. My favorite is the Tavern League. They have a live band playing country and western favorites, mixed with a bit of patriotic, gospel, honky-tonk, and bluegrass. The Tomah High School band always marches. Kids rush out to grab candies tossed by float riders. The Saddle Club is always the last unit in the parade. You might guess why-no need to walk in some of that “pony exhaust”. A large number of restored tractors are distributed amongst the units. Red Farmalls, green John Deeres, Persian orange Allis-Chalmers, prairie gold Minneapolis Molines, and maybe a gray 8N or 9N Ford. We have plenty of farm machinery collectors and restorers here in the Driftless hill country. They know the thrill of searching, finding, and final rescue of tractors that go back nearly a hundred years. They know the pride and satisfaction of turning a piece of rusty old junk into a good-as-new machine. One such miracle worker is Larry Baribeau. Larry allowed me to drive one of his International Harvester tractors, a 1958 diesel Farmall 560 beauty. This is the tractor that brought great sorrow to the International Harvester company. The Farmall 560 experienced problems due to the final drive not being strong enough to handle the power of the engine. A new rear end was offered by International in mid 1959, and the company sponsored a massive replacement program. Enough overtime was earned by some IH workers, they could buy a house. John Deere took the lead in farm tractor production. The Scheckel family had a Farmall 460 gas-powered model on the 238 acre farm outside of Seneca, down in Crawford County. Our Dad traded in a Massey Harris ’44 for the 460 when I was in high school, right about 1958. I had not driven a Farmall for over 50 years and what a thrill it was to climb aboard the 560, check out the shifting, try the torque amplifier, toot the horn, and feel the power of that 4.6 L, 6 cylinder, 55 horsepower diesel engine. 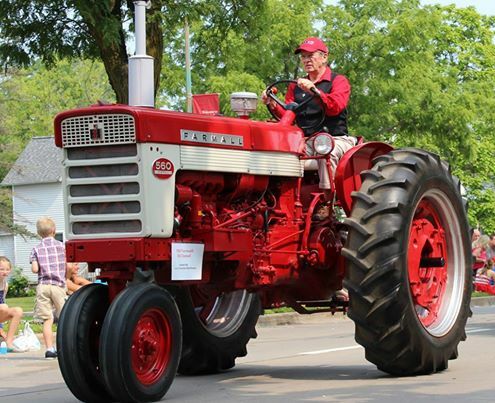 Best of all; Larry said I just might be able to drive another of his restored Farmalls in next year’s Tomah Fourth of July parade.